Manchester City goalkeeper Ederson has suggested his side went easy on rivals Manchester United in their 3-1 derby victory this weekend. 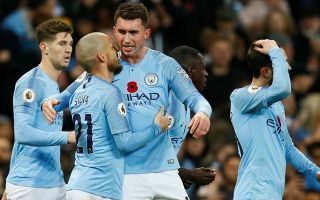 The Citizens ran out comfortable winners with a superb performance at the Etihad Stadium, with United never really in the game despite pulling a goal back through a penalty in the second half – their only shot on target in the entire match. Ederson seems well aware of City’s superiority, and has decided to twist the knife into United somewhat by suggesting the team could have won by an even greater margin if they’d wanted to. This suggests Pep Guardiola’s side decided to go easy on their rivals to a certain degree, which is not the kind of thing Red Devils supporters would want to think of as happening against their team. ‘We did a great game and got a deserved win,’ the Brazilian is quoted in the Telegraph. This could just be the kind of taunting that goes on after big wins in derby matches, with Ederson perhaps trying to play up to City fans by teasing United. One imagines it can’t be that often teams take it easy on their opponents, particularly in important matches like this.